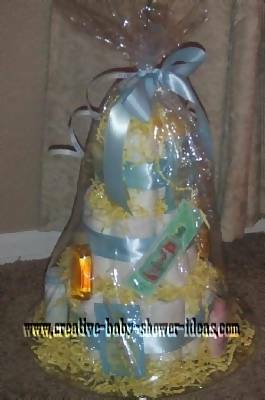 All of these diaper cake centerpieces have been submitted by our website viewers to help you create a fabulous diaper cake for your next baby shower. Give needed baby items in a fun and creative way! 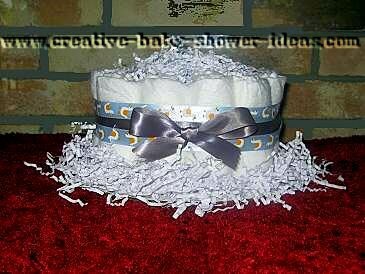 To create my Diaper Cakes, I coil together bundles of disposable diapers to simulate a tiered cake. 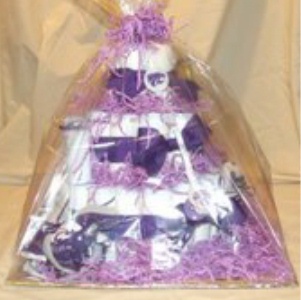 Each cake comes with a card, wrapped in cellophane and tied with a big bow. 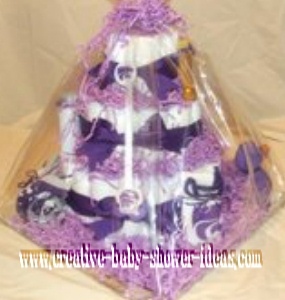 Diaper Cakes are made with special care for gifts to new parents, baby showers, or to be displayed in nursery! 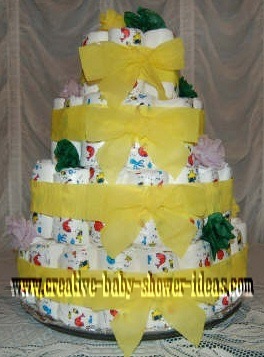 Cake is expertly designed and NO tape, pins or glue is used on diapers. I take great pride in making sure the Diaper Cake is a huge hit and that the cake will be remembered by all who have the opportunity to see it. 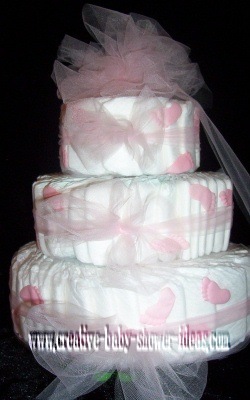 Each Diaper cake is made with a professional eye and is sure to impress! New parents will be delighted to receive this gift for their newborn! These make perfect Baby shower center pieces, decorations and or the best hospital delivery gift. I LOVE THEM!!! As you can see most of my friends have boys. I have a little girl, but nobody got a Diaper cake for me :( I will gladly make Diaper cakes for local baby showers. San Bernardino, CA. 909- 884-3717 please call for a quote. 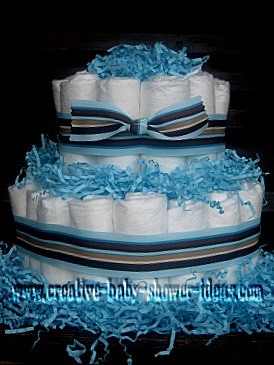 Here is a 1 tier diaper cake. Made with 20 diapers. Filled with a baby bottle. Hello, We ( the sisters and mother of the expectant mother) were planning the baby shower. 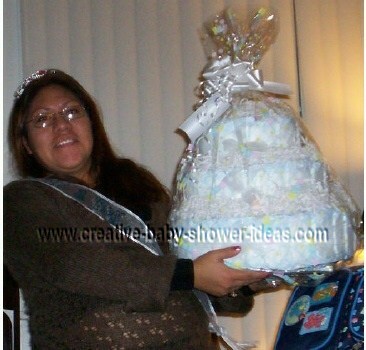 So we googled 'creative baby shower' as we didn't want it to be mundane, and your website was the first on the list. 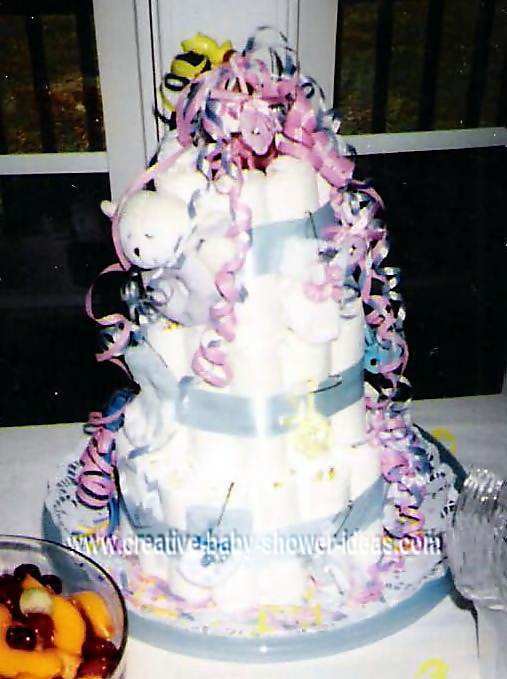 From looking through the photo gallery at the ideas for the Diaper cake we were impressed to try one ourselves. The attached photos are the results of such an attempt, Submitted by Nicole B. and Agatha L. of Barbados. To make the cake , we rolled each diaper as tight as possible and used rubber bands to secure them. Then they were placed in a circle first, to determine how big a base we wanted and then inside was filled with more rolled diapers. The entire first base was then secured using strong white string and any spaces observed were filled in with more diapers so that there was a very tight fit. The other layers were done the same way as the first. As we had no ribbon we used crepe paper to go around each layer and to cover the appearance of the rubber bands and the white string. This crepe paper also made the bows that are on each layer. Flowers, rosettes, were also made using the crepe paper and stuck into a space between the layers and spread out around the cake. 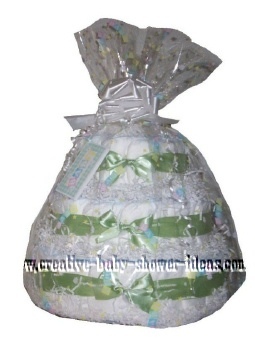 This diaper cake was made with 97 newborn diapers. 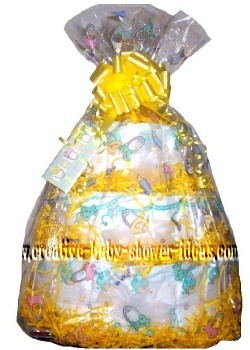 If any person in Barbados are desirous of having a diaper cake made for their shower, for a small fee, feel free to contact us at niccetta_98(at)yahoo.com. Replace the (at) with @ to send email. Thanks! 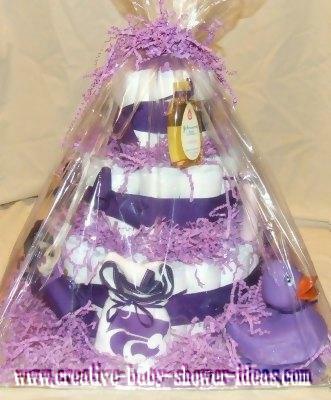 This diaper cake was made for a mom to be that lives in Kansas. She and her husband are big K-State fans. K-States colors are purple and white. It was the first Diaper Cake that my daughters Adrianne and Reniece made. They just bought the items and began to create!! 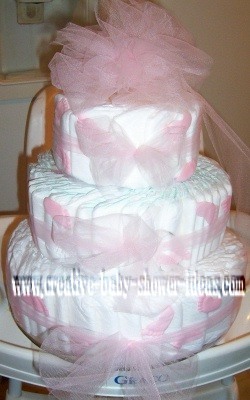 This is a classic 3-layer diaper cake held together with pink tulle. I used confetti in the shapes of footprints and placed them under the tulle. To hide the inside of the cake on the top layer, I made a bow out of the tulle and fluffed it. This project took me less than one hour to construct.